Sheffield Eagles moved further clear of the relegation zone after beating Rochdale Hornets 38-16 at Spotland. 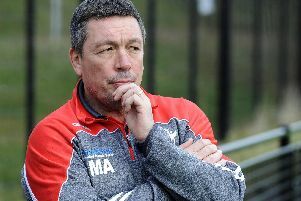 In a crucial game at the foot of the Betfred Championship, it was Mark Aston’s side who held their nerve as the Eagles recorded their second success against the Hornets this season. With several key performers returning, the Eagles banished any memories of their recent heavy defeat to Leigh, moving four points clear of the drop zone. It was the start that gave the Eagles the platform for success, and they opened their account with a free-flowing move which was clinically finished by Ryan Millar in the corner. Brown expertly converted. Aston’s side were certainly in the mood and a prolonged spell of pressure saw both Matty Costello and Greg Burns held just short, before persistence paid off as Burns burrowed over the line from dummy-half, and Brown again converted. Burns thought he was in again after claiming Aston’s spiralling kick but after evading the tackle he was called offside by referee Gareth Hewer. On 27 minutes the Eagles extended their lead further when Corey Makelim went for a gap in the Rochdale defence, before diving over the whitewash for his first try for the club. Brown converted. The home side finally responded through Lee Mitchell’s unconverted score, but the Eagles were over next as James made the initial break before Mark Offerdahl barged his way across the line, but Brown missed the extras. The Hornets had the final word of the half through Billy Brickhill’s converted try, and straight after the interval Matty Hadden stretched to score between the sticks leaving an easy conversion for Tyler Whitaker. With the home side sensing an opportunity, the Eagles regained their composure when Jack Ashworth collected a kick on the last to cross the whitewash. With Brown limping out of the game following an earlier collision, Fozard kicked the extras. A spirited break from James Bentley almost brought another try, but he was forced off soon after following another collision. The Eagles stayed focused and clinched the game inside the final 10 minutes through tries from Fozard and the returning Josh Toole. Rochdale: Kay; Lepori, Talatoka, T. Adamson; Cross, Whitaker; Yates, Taira, Brickhill, L. Adamson; Mitchell, Allen; Middlehurst. Interchange: Hadden, Hurst, Moran, Turner. Eagles: Makelim; Millar, Bentley, Costello, Blackmore; Aston, Brown; Pick, Burns, James; Ashworth, Toole; Fozard. Interchange: Moran, Offerdahl, Davies, Magrin.